* Creates a matte, non-reflecting finish when added to acrylic colors. * Mix into any acrylic paint to increase transparency and extend color, increase matte sheen, increase film integrity, ease flow of paint and add flexibility and adhesion of paint film. * Mix with Gloss Medium & Varnish to produce a semi-gloss or satin medium. * Opaque when wet, translucent when dry. * Mix with Soft Body Concentrated Artist Color to extend volume and increase translucency, while maintaining viscosity. * Mix with Heavy Body Artist Color or Basics Acrylic Color to extend volume and increase translucency, while decreasing paint viscosity. * Use as a matte fixative over artwork (pastel, graphite, chalk) to decrease gloss or shine. Mix 1 part Matte Medium to 1 part distilled water and apply with atomizer or airbrush. Excess medium applied to the surface may cause fogging. 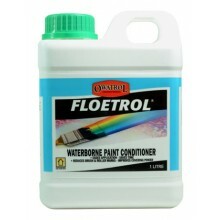 * Recommended fluid medium to use as a transparent ground (size), with excellent tooth and adhesion, instead of gesso. This will allow the color and texture of the support to show through. Can be used as a substitute for the rabbit skin and hide glue size traditionally used for oil paintings. 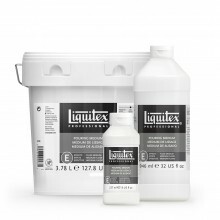 * For best results use Liquitex Clear Gesso which has more tooth for paint and pastels. * Exterior Murals: If the support or wall is somewhat smooth, a coat of Matte Medium should be brushed or two coats sprayed onto the surface onto the surface prior to gessoing.